Applications are open for the Social Finance Awards. These annual awards recognize the people and organizations who are helping to build an impact investing market that works for all. 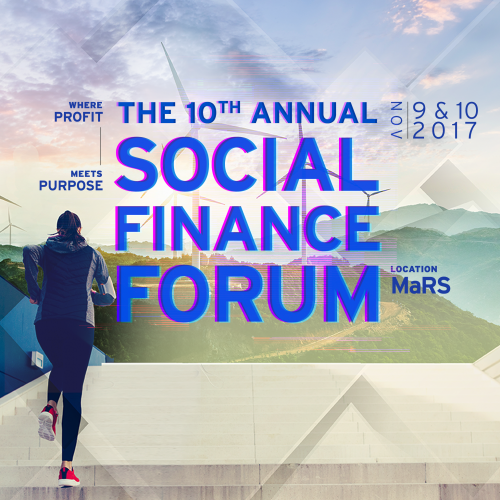 The winners will be announced at the 10th Annual Social Finance Forum, which takes place at MaRS Discovery District on Nov. 9 and 10. Building a social finance market takes time and effort but, above all, it takes visionary leadership. To recognize these individuals and inspire others to follow them, MaRS Centre for Impact Investing has created the Social Finance Awards. MaRS Centre for Impact Investing has partnered with ImpactAlpha, a leading source of news and analysis about impact investing. ImpactAlpha’s Brief (ImpactAlpha.com/TheBrief) provides daily news and actionable intelligence for those building an inclusive, resilient and prosperous future. The awards are divided into four categories. In three, organizations and individuals can put themselves forward. For the Ewart Newton Award for Social Innovation, you can only nominate someone else. The RBC Innovating for Youth Award will be presented to an exemplary leader in a Canadian incorporated for-profit, not-for-profit or cooperative organization that has created and/or demonstrated significant contribution in addressing key gaps and challenges faced by youth (ages 15-29) in Canada. The Impact Investor of the Year award will be presented to a Canadian organization or initiative that has created – or demonstrated a strong potential to create – positive social or environmental impact through direct investment. The investments must be into an impact venture, fund or project. This will be presented to a Canadian incorporated for-profit, not-for-profit or cooperative organization that combines business excellence with positive social or environmental impact and a financial return. Eligible enterprises are those that have been in operation for at least one year, have existing revenues or customers, and are able to demonstrate measurable impact in their target areas.